The more people know and understand this development, the better are the chances of molten salt reactors quickly becoming a global energy supply, finally giving us a chance to bend down the curve of growing fossil fuel use. One of the big challenges of nuclear is to be understood. The basics of nuclear energy, however, are really not very difficult to understand. The most important thing to understand is the nuclear reaction itself: a heavy nucleus, for instance uranium, catches a neutron and the nucleus fissions and splits in two parts. This reaction also produces a lot of energy. Really a LOT of energy: about two million times more than a carbon molecule reacting binding with oxygen produces: the process we usually call ‘burning’. How much better is ‘two million times more energy’? What are the practical implications of this number, ‘two million times’? Let’s have a look at one of my favorite graphs, to be found on page 164 of David MacKay’s Sustainable Energy – without the hot air (and as often repeated on this site, David MacKay is not pro-nuclear, he is pro-arithmatic). This graph basically tells the story of daretothink, so please have a careful look. MacKay combines two types of reactors ‘Once-through’ and ‘Fast breeders’ (left in the graph) with three types of resource options for uranium: mining, ocean extraction, river extraction (uranium salts are soluble, nature is providing us with uranium all over the planet). Elsewhere in his book, MacKay has calculated that the avarage Brit uses 125 kWh/d, so that is our reference for balancing supply and demand. Figure 24.6 page 164 – MacKay Sustainable Energy Quoting MacKay: ‘At last, a figure that beats current consumption! – but only with the joint help of two technologies that are respectively scarcely-developed and unfashionable: ocean extraction of uranium, and fast breeder reactors.’ Molten salt reactors will, in a few years time, get us rid of the ‘but’ in the quote above. That seems a big ‘but’ – is Daretothink cheating? No. First, the math for molten salt reactors is exactly the same as for the fast reactors that MacKay uses in his graph. At the time MacKay wrote these lines, molten salt reactors were only just rediscovered and very few people were aware of their potential. MSR’s are as efficient as, maybe even more efficient than fast reactors, even if they’re not fast reactors themselves (fast msr’s are definitely possible, but they will be more difficult to license). Second, the extraction of ocean uranium – however recent research shows the technique is coming along nicely – will not be needed for a long, long time. For a rough sketch of hów long, take a look at the column on the left. The difference between ‘once through’ and ‘fast breeder’ is 1 : 60. Simply put, this means that if we switch from a conventional (once through) reactor to a fast reactor (or an msr) a kilogram of uranium will deliver 60 times more power. We’ve been using nuclear power plants for the last 70 years. If we burn the uranium that we have already mined for these 70 years in the same pace, our present stores will last for 60 * 70 = 4200 years – without mining new uranium. Of course, this number is only a small part of our total energy use. Nevertheless, our already-mined uranium will last us centuries if we burn it in molten salt reactors. It also has to be noted that MacKay does not take our supplies of thorium into account. Doing so will roughly double the quantity of nuclear power that’s available. 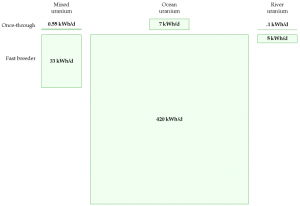 For a more detailed estimates, see the page how long will our supplies of thorium and uranium last. How big is the waste problem, really? If people have listened to the story so far, their next question is almost certainly: ‘but what about the long lasting waste?’ Fair enough, I’ll go into that in a few lines. But first, a small excercise in common sense for you. Suppose you’re sensible enough to listen to what the vast majority of climate scientists are saying. In that case you will feel pretty sure that going on with burning fossil fuel is a course in harms way. But even if you think climate change is not yet certain, you may have heard about ocean acidification – which is, from the standpoint of biodiversity even a worse case scenario (climate change is mainly a problem for humans, ocean acidification, caused by carbon dioxide, will almost certainly make whole ecosystems collapse in a few decades, which, of course, is also a problem for humans). So maybe your common sense will tell you our present course will almost certainly end up in big time trouble for all of us. Now, the common sense approach to the nuclear waste problem. As MacKay puts it, nuclear power is not ‘infinitely dangerous’ – even with nuclear energy in its present form, the waste problem is manageable. So the sensible thing to ask is ‘would it be wise to trade an almost certain disaster against a manageable problem?’. It’s up to you to answer that question. Figure 24-13 MacKay Sustainable Energy The present day nuclear waste problem of the average Brit: 760 ml of low-level waste. 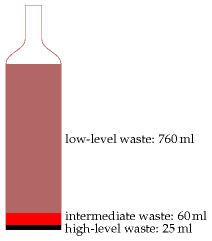 60 ml of intermediate waste, 25 ml of high level waste. 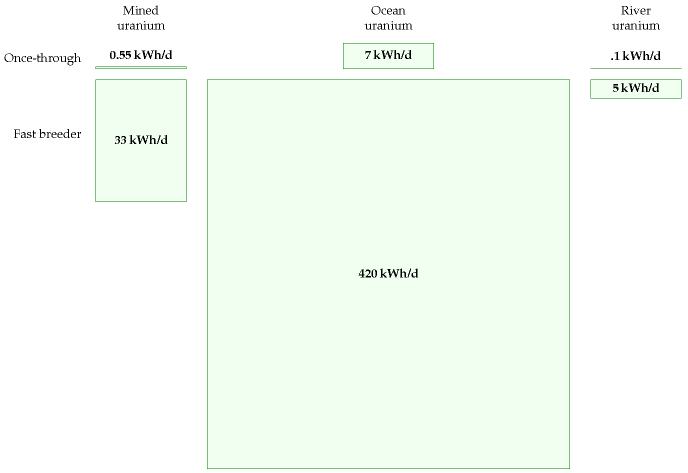 For molten salt reactors, the intermediate and high level wastes should be added up and divided by 60. This means: for the same amount of energy, a molten salt reactor will produce 85/60 = 1,5 ml of intermediate waste, which has to be stored for about 500 years. The waste equivalent for coal is 40 liters of fly ash and 1500 kgs of carbon dioxide. For molten salt reactors, which are about sixty times more efficient than present day nuclear reactors, this already pretty small waste problem is divided by sixty. Depending on the the type of reactor that is chosen, a molten salt reactor produces little or no long lasting waste. The difference is caused by the fact that an msr can use all of the energy content in the uranium (or thorium). Instead of stopping the transmutation proces at the point where less than one per cent of the fuel is used (as is the case in present day reactors) the ‘bad stuff’ that is produced during the process will be completely consumed. Is it possible for you to judge these claims for yourself? It actually is, but only if you’re willing to go into the technical details of molten salt reactors.If you are, you’ll find a lot of details in the section MSR’s in development. If you don’t like going into the technical details, but would prefer to just get the general line of the argument, I have this comparison for you. A comparison that is meant to clarify two aspects of nuclear energy: the first is why present day nuclear energy is producing nasty waste and second why nuclear energy is regarded as ‘complicated’. The reason that present day reactors produce waste is the fact that they burn less than half a percent of the natural uranium. Present day reactors use solid rods of uranium oxide as a fuel. Inside these rods, uranium is transmuted in all sorts of other elements and this spoils the quality of the rods as a fuel. Due to their being a solid, little can be done to keep up the quality of the fuel while it’s burning. After 12 – 24 months of use, the operator has no choice but to be replace them. You could compare this to burning wood in a fireplace. And then to doing this: a short while after your fire has really started going, you throw in a bucket of water to stop the reaction (burning wood is a chemical reaction). Now, you have smelling pile of waste that you should dispose of. 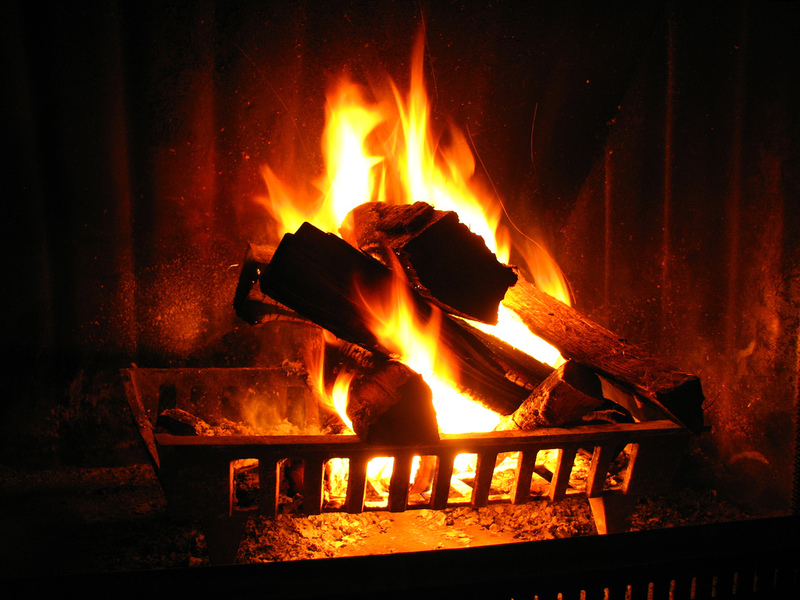 And it’s nasty stuff too: due to it being not fully burned, it will be full of compounds like polycyclic aromatic hydrocarbons and bisphenols – carcinogenous stuff that most people in history that have cooked their meals over fireplaces have never heard of. I’m pretty sure that if we’d have a national debate about the possible dangers of burning wood, and the difference between burning dry wood and wet wood, in fireplaces, stoves or pellet stoves, in relation to burning efficiency and the possible production of carcinogenous chemicals, we wouldn’t be getting anywhere. If you have nice fire going in your fireplace, and you stop it by throwing a bucket of water over it, you’re left with a pile of smelly and pretty poisonous waste. Essentially, this is the procedure in present day reactors. In molten salt reactors, you allow the complete ‘burning’ of your fissionable metal in the form of a molten salt, either uranium, thorium or plutionium or a mixture of these. Complete burning delivers sixty times more energy per kilogram metal, and sixty times less waste. The waste is actually very usable stuff, as will be explained elsewhere. Here’s why the motto of this site is ‘Why molten salt reactors will make you love nuclear power’. It’s because molten salt reactors burn all the uranium, producing sixty times more heat and leaving no nasty stuff that should be stored in long term geological deposits. In fact, once molten salt reactors start coming online, we will gradually empty all these deposits, burn the contents in molten salt reactors and transform a headache into clean power. In our present practice of burning less than a single percent of the uranium, nuclear energy will remain being complicated, with endless options for confusion. This can make it challenging to to speak about nuclear in simple statements that anyone can understand and that are also accurate. This video of Gordon MacDowell nicely shows how misleading statement statements on nuclear energy can be. It’s title is based on a quote of Dr. Arjun Makhijani – “Nuclear Reactors Create 30 Bombs of Plutonium Every Year”. Now that seems like a simple, understandable and terrifying line, and since the man is a physicist, you’d say the statement should be accurate. The video shows just how misleading this statement is. On the occasions molten salt reactors find their way to the news pages, the reports are often not quite accurate, only partially true or even completely inaccurate. Understanding is really the only sustainable antidote to the relentless stream of desinformation about all things nuclear. This site aims to supply you with a simple story, backed up by a load of checkable resources. So start checking, find facts, dare to think – and then, share it with your friends.